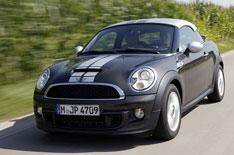 Mini Coupe Cooper SD review | What Car? What is it? This two-door, two seat coupe is the fifth and newest member of the Mini family, and when you think about it, it's surprising that the brand didn't produce the car sooner. After all, coupes are all about style and fun, and Mini certainly knows how to provide those two qualities in abundance. What's it like to drive? There will be four versions of the Mini Coupe, with each one carrying the Cooper name to reflect the car's sporting intentions. Three of those versions will have petrol power the 120bhp Cooper, the 181bhp Cooper S and the 208bhp John Cooper Works (JCW). Thanks to an earlier drive in a pre-production version of the JCW, we know that its performance is just as stonking as the numbers suggest. This time, though, we had a go in the range's only diesel, the Cooper SD. Power comes from the 141bhp 2.0-litre diesel engine that's recently made its way into other Mini products, and has disappointed in many of them. It's better in the Coupe. You're not subjected to quite as much irritating noise and vibration as you are in, say, the Countryman Cooper SD, so things feels altogether more civilised. The engine isn't as woefully lazy at the bottom of the rev range, either, making the Coupe feel a fraction perkier. However, it's still pretty lethargic at low revs, and even when it gets into its stride, it doesn't have the strength of acceleration you expect from a car wearing a Cooper S badge. That said, it's still fun to drive. The Coupe has a stiffer body than the hatchback, and comprehensively revised suspension, which you'll notice in the way the car handles. The Coupe feels a tad grippier than the hatch, and although you'll have to be pushing hard to notice it, the body control is a little tighter, too. The balance of the car, meanwhile, is everything you expect from a Mini. However, there's one thing that prevents it from being more fun than the hatchback, and that's the steering. It's very quick and responsive, but the combination of a strong self-centring action and inconsistent weighting makes it feel twitchy - you'll find yourself sawing away on the wheel to stay on your intended line through bends. You don't get much feedback through the wheel, either. We have one or two slight concerns over the firmness of the ride, too. It didn't translate into discomfort on the immaculate German roads of our test route, but put the Mini Coupe on the sort of surfaces you find in the UK, and we can't promise it'll be the same story. What's it like inside? The dashboard has the same design as the hatchback's, so it's suitably funky, but also full of messily arranged and poorly marked switches. Some of the plastics are as disappointing as they are in the hatch, too, but the Coupe still feels like a slight step up in quality. Among the upgrades is a ridged metallic dashboard finish that resembles posh corrugated iron it's a nice touch. Rear visibility, on the other hand, isn't so great, because of the shallow rear window and thick pillars. When the boot spoiler pops up automatically at 50mph to aid stability, it eats into your view even further. Still, you get bags of adjustment for the seat and steering wheel to help you find a comfortable driving position, and despite the roof being lower than the hatchback's, the passenger compartment is roomy. The Mini Coupe doesn't score too badly on the practicality front, either. The rear seats have been swapped for a storage shelf, and there's a hatch through to the boot that allows you to retrieve or load small items from the cabin. The boot itself is also a decent size at 280 litres (that's 20 litres more than the Clubman gives you). However, the space is quite shallow and the floor uneven. Should I buy one?We can see plenty of reasons why you would. With prices ranging from 16,640 to 23,795, most models are cheaper than equivalent versions of the Volkswagen Scirocco and Peugeot RCZ, never mind the Audi TT. Take this SD version, for example. It costs 20,510, which is 1700 less than the Scirocco 2.0 TDI and more than 2500 cheaper than the RCZ 2.0 HDI. You can also always rely on Mini for stunning residual values, so the Coupe should prove a sound long-term investment. Each engine gives either good or great fuel economy and emissions considering its power output, so running costs should be reasonable. You even get a decent amount of equipment, including alloys, air-con, parking sensors and a DAB radio. However, neither of the two versions we've driven (JCW and Cooper SD) are likely to be the sweet spot in the range. We love the 120bhp Cooper engine in other Minis, and if it's as good in the Coupe, then the entry-level version's 16,640 price is going to look very tempting to style-conscious buyers. If you want a little more go than that, the Cooper S can be had for less than 20,000. That's not half bad for a car with so much style, performance and desirability.